In other section you can find less common script guides. To invoke the Other guides dialog, please click on the Other button. 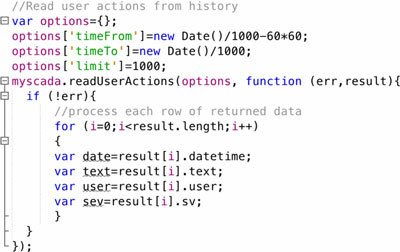 To read history of user actions, please select the tab User Actions History. Limit by time: first you can limit the data by provided time. Time is specified in UTC format in seconds since 1.1.1970. You can enter a value or provide a variable where the value is stored. Limit records to: please provide limits for the number of records loaded. You can also specify if the limit is taken from the beginning eg. “from start” or from end. With this function, you can easily fill in data-log with data computed in server side scripts. This can be very convenient in cases when you want to log computed data instead of raw data from the PLC. We will show how to create a custom data-log and fill it with data in server side scripts. 3. Firstly, we need to create a custom data-log definition. This is an data-log which will hold our data. 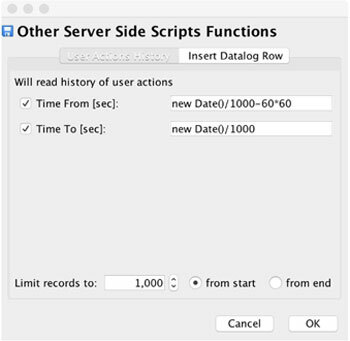 To do so, please navigate to Script Data Logs in server side scripts. Here create a new data-log and give it a name. As you can see, we have created data-log with 3 values, two numeric and one string. As you can see, Script data-log has the same definition as regular data-log. Only difference is, you don’t link script data log to any data source, but you fill in its values from the server side scripts. 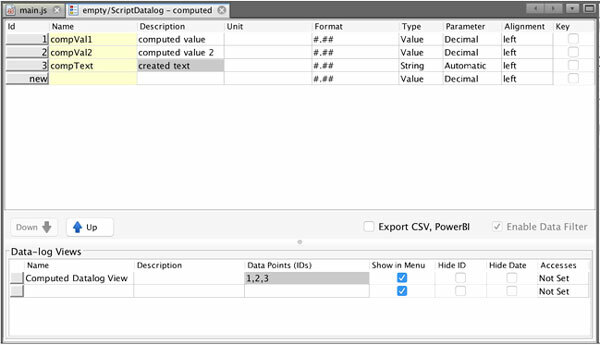 Also, you can create a data-log views for this data-log as you would do with regular data-log. Once you are done with definition, we will proceed to data filling. 4. Filling the data-log with data. To fill our created script data-log with data, please click on the Other button and select an Insert Datalog Row tab.